On Oct. 23, President Trump held a press conference denouncing the growing caravan of refugees from Honduras and Guatemala who are making their way toward the U.S./Mexican border in hopes of getting asylum in the United States. The president proved once again he is a professional liar who cannot keep his falsehoods straight, even in a single sentence. Trump claimed that the caravan contained Middle Eastern terrorists, but when pressed by the media acknowledged he had “no proof,” then said that there “very well could be” and finally that “there don’t necessarily have to be.” He also insisted M-13 gangsters had joined the exodus without any proof. The president denied queries that he might be using the caravan to gain political points by whipping up xenophobic fears. “I’m a very non-political person,” he asserted, ridiculously. He then called on Vice President Pence to repeat claims allegedly made by Honduran President Juan Orlando Hernández in a phone conversation Tuesday morning. According to Pence, Hernández said that the migrant group was financed by Venezuela and organized by Honduran leftists. In fact, Bartolo Fuentes, a former Honduran legislator, is the initiator of the caravan, one of many that have left Honduras over the years to escape poverty and repression. And this was perhaps the biggest lie of all. It is the United States of America which has violated the rights of the people of Central and Latin America through its devastating economic policies and by supporting completely corrupt regimes in Guatemala, Honduras and Mexico — and not over a single year or decade, but over a century. In 1954, the CIA engineered a coup against the democratically elected government of President Jacobo Árbenz in Guatemala. This resulted in a 30-year civil war during which the U.S. supported one bloody, right-wing regime after another. Today the U.S. is defending Guatemala’s president against a massive popular uprising over spectacular government corruption. In 2009, the Honduran military carried out a coup against democratically elected President José Manuel Zelaya. The coup was denounced by the Organization of American States but endorsed by the U.S., which for years has used the country as a base of military operations against revolutions in Central America, most memorably for President Reagan’s contra war against the Sandinistas. Meanwhile, Mexico receives millions and millions of dollars in U.S. military aid every year to support a profoundly dangerous and undemocratic regime that undermines labor and indigenous rights and under which femicide is commonplace. It is the people of Latin America who have been abused and exploited by their neighbor to the north, not the other way around. Now they are fleeing because of the intolerable conditions created or condoned by the U.S. government for the benefit of U.S. business. 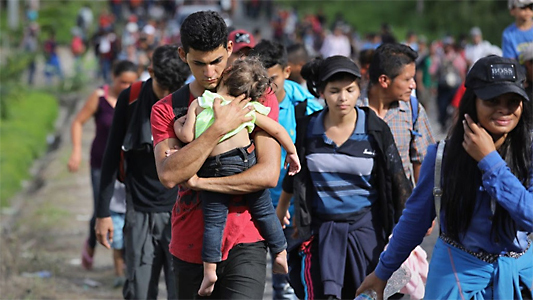 In the name of basic human solidarity and justice, the Freedom Socialist Party calls on the United States to open its border with Mexico and allow these refugees into the country. We also call for an immediate halt to all military aid to Guatemala, Mexico and Honduras as well as the closing of all U.S. military bases and the withdrawal of all U.S. soldiers and military contractors from Latin America.